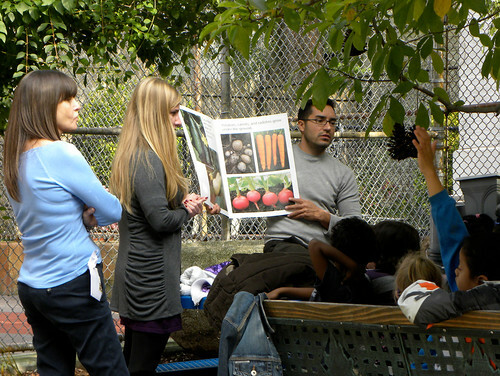 Parent Coordinator Margaret Sheri and her green team parents held another open house today at the PS 102 School Garden. It was a gorgeous fall day made even more beautiful by the presence of groups of young students shepherded by their teachers. This, after all, is what this garden is really all about. Growing tomatoes is significant but growing minds is far more important. This was just the beginning of using the new garden as an outdoor classroom. It was great to see it happen! Margaret reports that 56 staff members visited, 22 scheduled their classes to come into the garden, and four even visited today with no advance planning. What a great start! Margaret and the parents who have worked so hard to make this all happen deserve a standing ovation. Yesterday was a beautiful and productive day in the PS 102 School. A group of interested (and interesting) parents met in the garden and we had a sub-irrigated planter (SIP, aka "self-watering") workshop among other activities. How nice it was to meet at this picnic bench under a shade tree on such a nice day. 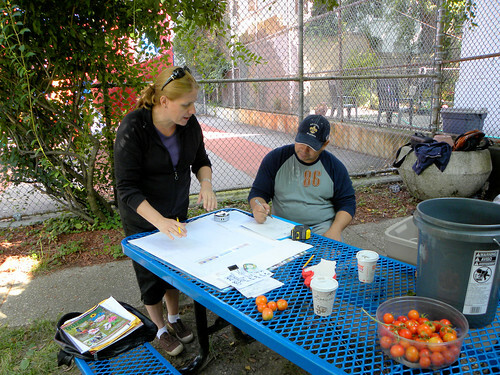 In the top photo we see garden coordinator Margaret Sheri and parent Edward Andrade working on a plan view of the current garden. Measuring what is here now and documenting it is perhaps the most important step in developing this neighborhood treasure. It is nice garden now and the future potential is awesome. Led by parent Chris Sichler, some very beneficial cleanup work was also accomplished. 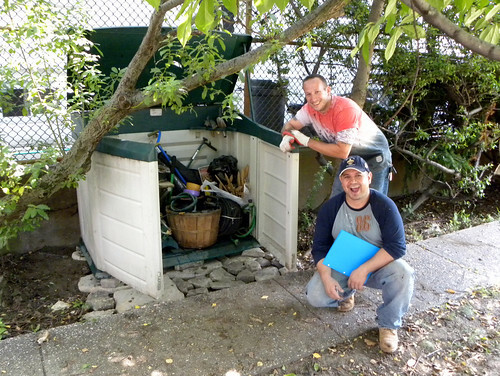 Chris did a yeoman’s job in sorting stuff and cleaning out the tool shed. We know what we have now. He also cleaned out the rotary composter that has been standing idle. For sure, we will have a school composting program along with rainwater harvesting in the coming years. It is such a pleasure to be a part of this PS 102 parents “green team”. I was amazed at what was accomplished. A somewhat sleeping garden is now wide-awake. What a future! See the complete PS 102 photo set on Flickr and view a slideshow. Better late than never, is an heirloom Black Giant purple tomato wannabe looking through the chain link fence surrounding the PS 102 PONG. It is a minor miracle that it is here. It has been one predicament after another, all of them created by humans rather than the plants. 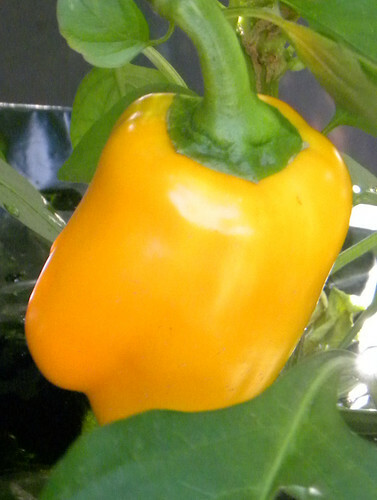 There has been absolutely no problem with the seeds, plants or sub-irrigated bucket planters (SIPs). The SIPs, true to form, work like a charm. If all goes well this little guy will become a large juicy purple heirloom tomato easy to see by everyone walking by the garden. Stay tuned to see what may be the only photos of Black Giant tomatoes on the web. Baker Creek Heirloom Seeds sold out and removed the photo from their website. I searched but could not find any other photo of this soon to be purple beauty. 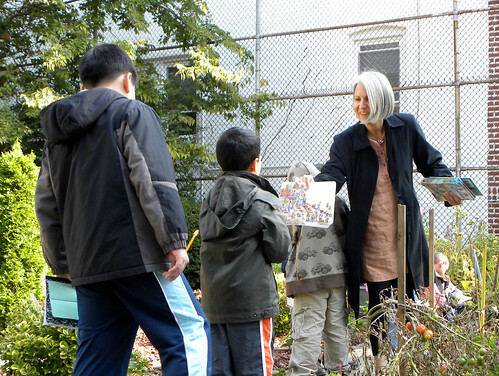 A new gardener has arrived at the PS 102 garden. The first time I spotted this Mourning Dove fledgling, he was sitting on top of one of the sub-irrigated bucket planters. He obviously was enjoying his perch on the plastic mulch. This city bird is obviously compatible with the built environment integrated with the natural world. I had spotted his mother previously and when I saw her fly into some tall bushes I knew there was a nest. This little guy is the proof. I’ve also discovered a female fledgling. So, we can call the PS 102 PONG the garden of the doves if we like. What a good omen for the student garden club that will start here in the fall. 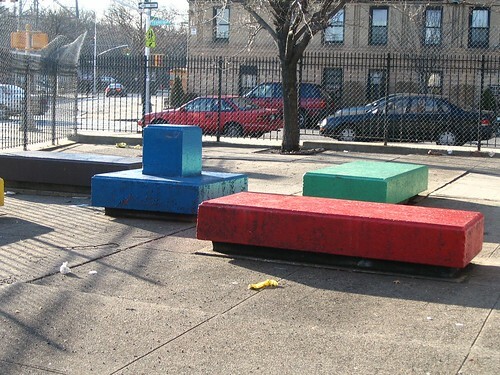 The story in todays Daily News led by this photo of EarthBoxes isn't about them. It's about a stolen planter. Wouldn't it have been good if this was a more positive story instead about a new PONG like the one at PS 102? Those familiar with the EarthBoxes (excuse me, "pots") recognize them immediately. That doesn't include the reporter. There is no mention of them until the last two paragraphs. There are many other EarthBoxes in school gardens. I wonder how many. Please tell us if you know of any school gardens in your community using sub-irrigated planters (SIPs). It will take time but there is no question that SIPs are the wave of the future in urban edible gardening. 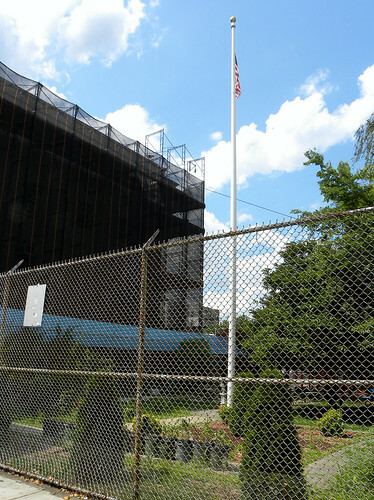 This playground is adjacent to the school building housing MS 352 Ebbets Field Middle School and PS 375 Jackie Robinson School. Along with the McDonalds across the street there are two other fast food restaurants only a block away. Incidentally, that huge apartment complex used to be the beloved Ebbets Field, home of the Brooklyn Dodgers (aka "Boys of Summer" and "dem bums"). 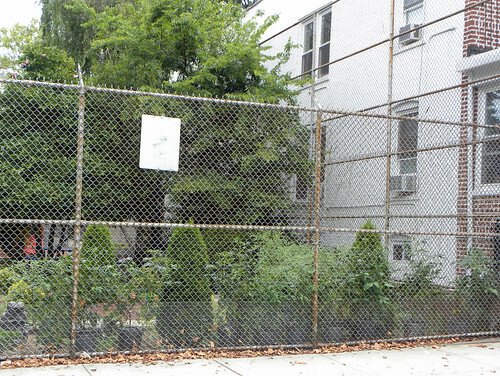 With a relatively small investment of time and money, this could become a Portable Outreach Neighborhood Garden (PONG) like the one recently installed at PS 102 Bay View School in Bay Ridge, Brooklyn. A PONG in this space would certainly do much to improve the streetscape and the neighborhood diet.